It’s a an engineers dream to create a flexible electronic device like an e-reader or a tablet, or even a smartphone. Imagine being able to fold your tablet up into your pocket. Now, a team of chemical engineers at Stanford University has created a process whereby flexible chips can indeed tolerate the power fluctuations in carbon nanotube circuits. “This is the first time anyone has designed a flexible CNT circuits that have both high immunity to electrical noise and low power consumption, ” says Zhenan Bao, a professor of chemical engineering at Stanford University. Bao holds an appointment in Chemistry and Materials Science and Engineering at Stanford. Most silicon chips are already based on a circuit design that allows them to function without interruption even when there are power fluctuations. However, this becomes an even greater challenge to apply this technology to CNT circuits. It seems Bao and his team have cleared that hurdle now. The new findings were reported in the Proceedings of the NationalAcademy of Sciences. Lead authors on the paper were Huiliang (Evan) Wang, a graduate student in Bao’s lab, and Peng Wei, a previous postdoc in Bao’s lab. 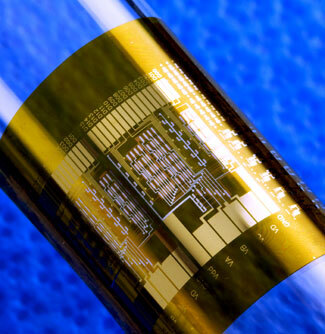 What they found was that at least in principle CNT should be ideal for creating flexible electronic circuitry. The physical strength of these carbon filaments do possess the physical strength to withstand the wear and tear that comes from consistent bending. As well, the electrical conductivity that exists should also be able to perform most any task. While this all sounds very straightforward, it is important to note than until now, flexible CNT circuits simply did not have the reliability or power efficient enough to compare with rigid silicon chips. In the past, engineers have discovered that electrical currents can pass through a semiconductor in two different ways. It can either jump from one positive hole to another, or it can push its way by way of negative electronics. These two types of semiconductors are known as the P-type and the N-type respectively. Engineers discovered that circuits that are based on a combination of both P and N-types do perform reliably even when there are fluctuations in power. On top of that, they also use much less power. This is what is known as a complimentary circuit, when the P and N-type circuits are combined. So the challenge for the team became adding N-type characteristics to what are predominantly P-type semiconductors. The problem: there just is no simple method for doping these carbon filaments. The paper itself describes how they overcame this obstacle. What they did was to treat the CNTs with a chemical dopant of their own they call DMBI. The process they developed was an ingenious as it was obvious. They used an inkjet printer to deposit the substance into the precise locations on the circuit itself. This was the first time a flexible CNT circuit had ever been doped to create a P/N-type blend. Bao has taken her research even further, now using it to compete with existing formulated plastics. Just as silicon is the basis for rigid electronics, Bao hopes that her experiments will become the new standard for bendable electronics. While CNTs are still a relatively new material, they are quickly catching up to plastics. Bao’s experiments are not just a breakthrough scientifically, but a step in the right direction when it comes to commercializing the process itself. “CNTs offer the best long term electronic and physical attributes,” Bao says. An estimated 20 gallons of gasoline are produced from the average barrel of oil.